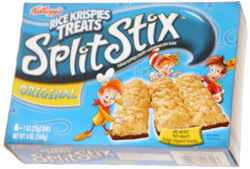 Taste test: This box contained six individual packages of Split Stix, each a rectangular Rice Krispies Treat coated with fudge on the bottom, with two sets of full-length indentations so that it can be separated into three stick-shaped pieces. The box said "no mess!" to separate the pieces, but you're likely to get at least a little bit of sugar on your fingertips, because you you need to get a firm grip on the bar the separate the pieces. The taste was standard Rice Krispies treat with a little fudge that just slightly altered the taste. 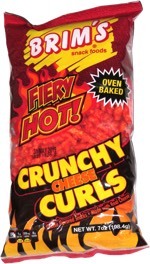 As gimmicks go, this one wasn't so bad, and having the bar in pieces allowed me to strech my snacking experience over a few minutes' span. Smell test: Mild fudge and marshmallow smell. OK.